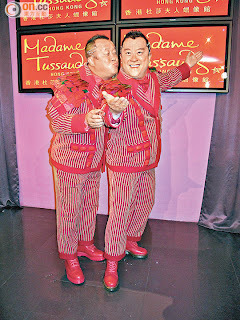 Eric Tsang Chi Wai and his son Derek Tsang Kwok Cheung appeared at the Peak's Madame Tussaud's Hong Kong for his wax figure unveiling ceremony. 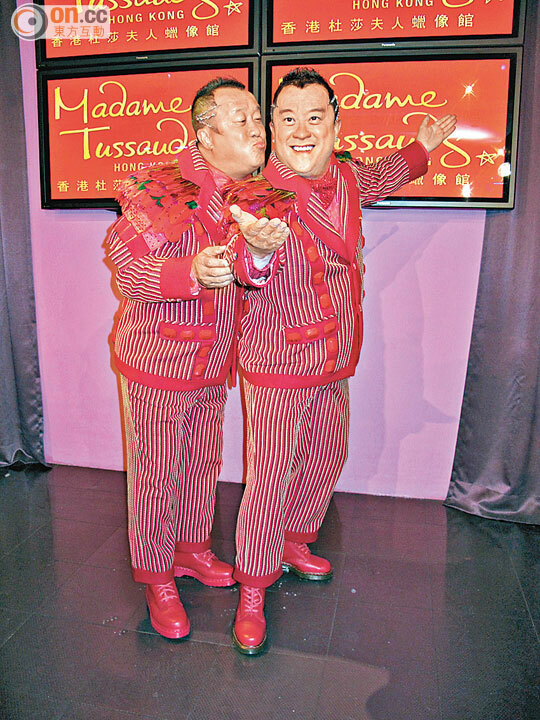 Chi Wai wore what exactly his wax figure was wearing, with the same pose and trademark smile he stood still next to the wax figure. Even Tsang Kwok Cheung who was responsible for the unveiling could not tell them apart and admitted back stage he truly picked the wrong father. Chi Wai was surprised how convincing the wax figure was. He said, "5 days ago we set the color for the wax figure, the first tim I saw my own statue I was surprised. Hair, eyes, teeth even the facial hair was similar, but the real person is still prettier. I walked around the museum and I dare to say that mine is the most realistic." Chi Wai said that later he will work on Raymond Wong Pak Ming's Lunar New Year film. For several years Chi Wai made Lunar New Year films for TVB to compete with Wong Pak Ming. This time Wong Jing will make the Lunar New Year film FROM VEGAS TO MACAU for TVB. Did he switch sides to help Wong Pak Ming? He said, "Actually the one he asked dropped out, I lent a helping hand. (A lot of salary?) Of course, but it isn't astronomical yet. (Did you explain to TVB?) I told them. TVB is afraid that sending Chow Yun Fat to 'war' may not be enough of a victory, so they send me to drag him down." Chi Wai also revealed that his costume in the film will be exactly the same as Tony Leung Chiu Wai's in THE GRANDMASTERS (YUT DOI JUNG SI). He will even duel with Sandra Ng Kwan Yu like Wai Jai and Zhang Ziyi.